Canton, Ohio’s Best Bowling Center is Stark County’s First Choice for Affordable Family Fun! Sunday: Noon - 1 a.m.
Monday: Noon - 1 a.m.
Tuesday: 5 p.m. - 1 a.m.
Wednesday: 9 a.m. - 1 a.m.
Thursday: 9 a.m. - 1 a.m.
Friday: Noon - 2 a.m.
For more information about prices and specials, including Open Bowling, Glow Bowling, and our summer-long Kids Bowl Free Program, please give us a call at 330-452-3700. 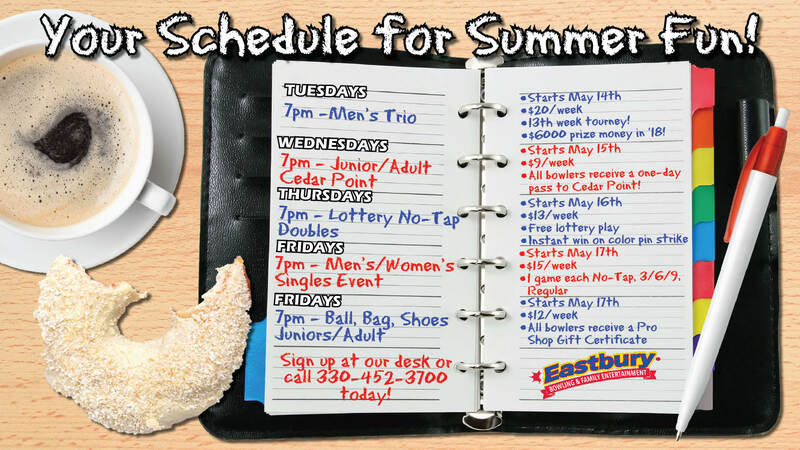 Eastbury Bowling Center offers the best in family FUN and family entertainment in Canton, Ohio. What makes Eastbury such a great place to get in the game with family and friends? First, our prices won’t break your budget. Next, our 36 top-of-the-line synthetic lanes and scoring monitors make all the difference in your bowling experience. We also have bumper lanes that keep balls out of the gutters and smiles on the faces of your young children. Fridays, Saturdays, and Sundays we turn down the lights and crank up the music for the area’s best Cosmic Bowling experience with a spectacular special effects light show, lasers, multi-colored runway lights that pulse to the music, and an exclusive Living Wall. You can also put your bowling skills to the test and join a league. Whether you are a seasoned bowler or new to the game, it’s a great way to socialize with old friends, meet new ones, learn new skills – and get motivated to up your game! When you’re not busy bowling, you can keep the fun going in our full-service sports bar, where you’ll always find the Browns, Cavs, or Indians on our 118-inch big-screen. Plus, our array of flat-screen TVs gives plenty of sports coverage to satisfy fans of other teams and sports. Eastbury’s game room raises the bar in excitement with video games, pinball machines, and 8 regulation pool tables. Want to unleash your inner pinball wizard with the Sopranos, Wizard of Oz, Addams Family, and more? Want to practice your breaks or get in a game of Eight Ball? Eastbury has you covered. So whether the plan is to enjoy a few frames by yourself, have somewhere to meet with friends and family, book a corporate party, or join a league, you’ll find Eastbury Bowling Center the place to go for affordable fun!